I picked this one up after catching Jenny S’s review the other day. Weirdly my library had it immediately available so here we are. I agree with Jenny, this is not one I see myself reading again. Or even recommending, honestly. Still, I wouldn’t call it bad. 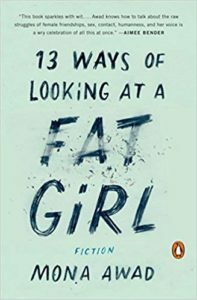 13 Ways of Looking at a Fat Girl is comprised of multiple small stories seemingly about the same woman (Lizzie/Beth/Liz/Elizabeth) strung throughout her life and throughout her battle with herself and her weight. Her dress size changes drastically, but her self worth is pretty well-cemented – I use “cemented” deliberately, given how it really drags her down. There is really nothing uplifting to be found here and if it’s funny, it’s really more of a “laugh because lord knows how else I’m supposed to respond”. I am someone who has struggled with body image basically since puberty, though I was always straight-sized (able to find clothes that fit outside of a plus-size environment), I was profoundly unhappy and, at least for me, that’s been a darkness I haven’t been able to banish, even more than a decade after I lost the weight. I see the skinny women in the gym and wonder what it’s like to work out without the goal of weight loss. I see skinny women enjoying a margarita and feel genuinely bitter. There’s an internalized hatred of seemingly-effortlessly skinny and beautiful women that I cannot explain, I can only fight within myself. It’s like a jealousy where hating a stranger is easier than accepting yourself. So much of this main character’s internal dialogue rang horribly true for me. Overall, not a great book to read the day before you go shopping for a wedding dress. Share the post "A little too familiar"
People say I have a reading problem. I don’t think I could read this. Dealing with the issues without hope is a nogo for me!